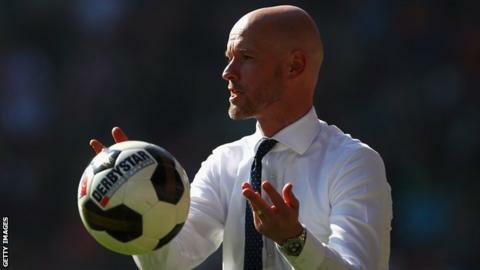 Ajax have named FC Utrecht's Erik ten Hag as their new head coach following last week's high-profile clearout. Marcel Keizer and assistants Dennis Bergkamp and Hennie Spijkerman were sacked after Wednesday's Dutch Cup defeat by FC Twente. Ajax, who sit second in the Dutch league, were eliminated from the Champions League and Europa League in the preliminary rounds. Ten Hag will sign a two-and-a-half year deal which starts on Monday. General manager Edwin van der Sar and technical director Marc Overmars - who is a former Arsenal team-mate of Bergkamp - made the decision to remove the trio after "a poor start to the season". Reserve team boss Michael Reiziger had been appointed as interim coach, with Winston Bogarde his assistant. Ten Hag, a former centre-back who spent the majority of his playing career with FC Twente, is a former assistant coach at FC Twente and PSV Eindhoven. The 47-year-old then spent time in Belgium and Germany before joining FC Utrecht in May 2015.